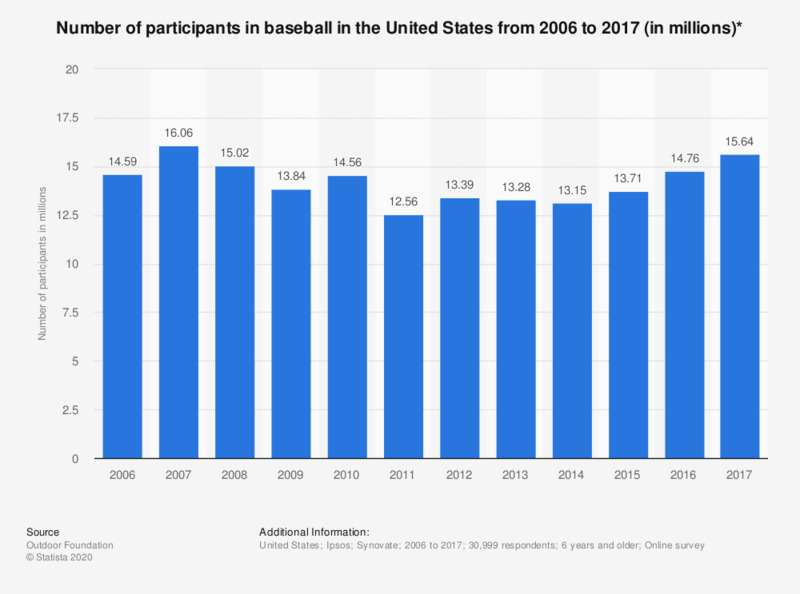 This statistic shows the number of participants in baseball in the United States from 2006 to 2017. In 2017, the number of participants (aged six years and older) in baseball amounted to approximately 15.64 million. * A weighting technique was used to balance the data to reflect the total U.S. population ages six and above. A participant is defined as an individual who took part in the activity at least once in the given year. Number of survey participants: 40,141 (2009) / 38,742 (2010) / 38,172 (2011) / 42,363 (2012) / 19,240 (2013) / 10,778 (2014) / 32,658 (2015) / 24,134 (2016); Information on survey dates for 2006 to 2008 were not given. Everything On "Major League Baseball" in One Document: Edited and Divided into Handy Chapters. Including Detailed References.